Is your refrigerator not cold enough? Check to make sure that your refrigerator doors are closing tightly, and that there is nothing on the refrigerator doors getting in the way, or that the refrigerator shelves are not hitting the doors and causing them to remain ajar. Check your door seal (the rubber gasket around the refrigerator door). 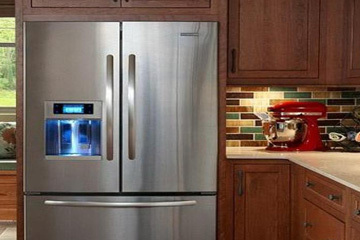 When the door is shut, check it to make sure the gasket is remaining in contact with the refrigerator with NO gaps. Check for rips or tears where the black magnet may be hanging out. This happens most commonly on the lower door seal or the hinge side of the door. Vacuum out the condenser coil under the refrigerator. Pull the refrigerator away from the wall and give it a good cleaning. If you can, use a long brush (coil brush) to help vacuum up dust. If you can’t reach all of the coils – blow the dust out by reversing your shop-vac hose. Make sure the lights are shutting off when the door is closed (work the light switch with your hand). Make sure your freezer or fresh-food sections are not packed too tightly. The refrigerator needs airflow around the vent and needs to be clear of plastic/freezer bags. Look for ice build-up or just too much food being packed in. Also in the upper shelf in the fresh food section – that should be used for milk or bottled drinks. This gives the vent (at the top of the fresh food section) 10”-12”of space for better venting. All of these tips will help your refrigerator work less – giving it a more even temperature and will cost less to run it!